The Institute of Nuclear Chemistry at Johannes Gutenberg University Mainz (JGU) will get a subterranean building for its new cyclotron. Parallel to the extension of the Nuclear Chemistry building, Mainz University is constructing a new complex containing the cyclotron room, a technical facilities room, a control room, an air lock, and a synthesis room. Total costs for this complex are around EUR 1.2 million. The large-scale research facility is primarily used to produce short-lived isotopes for basic research and for the production of radiopharmaceuticals needed in positron emission tomography (PET). The particle accelerator will cost approximately EUR 1 million and is financed with funds from the German Research Foundation (DFG) and the Rhineland-Palatinate Research Initiative. 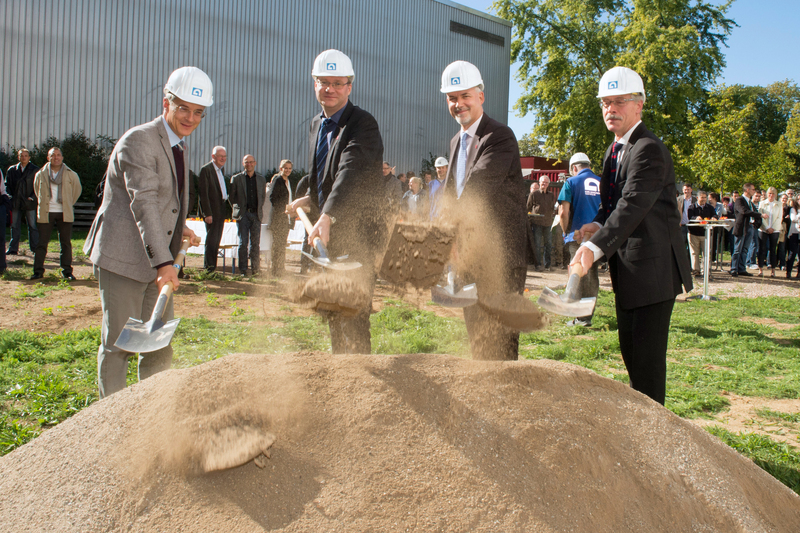 "This major research facility will provide excellent infrastructure for our strong research areas and will improve their competitive edge both in the national and international arena," explained the President of Johannes Gutenberg University Mainz, Professor Georg Krausch, during the groundbreaking ceremony for the cyclotron building. Professor Dirk Schneider, Dean of Faculty 09 – Chemistry, Pharmaceutical Sciences, and Geosciences, added: "Along with other building projects, this is another important step in delivering renovation and further development for our faculty." The cyclotron building is a subterranean construction covering a surface area of 83 square meters. The cyclotron will be lowered through an opening in the roof which will then be closed again. The particle accelerator will be used primarily to produce the short-lived isotopes F-18 and C-11 isotopes. These are used for the production of radiopharmaceuticals. The DFG-funded Collaborative Research Center on "Nano-Dimensional Polymer Therapeutics for Tumor Treatment" and the Mainz University Medical Center will continue to collaborate on the use of radioactive isotopes. Professor Frank Rösch from the Institute of Nuclear Chemistry points out that studies with F-18 have been limited up to now because this isotope had to be acquired externally. Studies with C-11 could not be performed at all due to its short half-life. "With the commissioning of the Mainz cyclotron the production of medically-relevant radioactive marked molecules will reach a new quality level. This is an aspect of vital importance for applied and basic research," said Rösch.